For most people today's Abington is a service station on the M74, conveniently located at the point where Edinburgh-bound traffic leaves to follow the A702 through Biggar and West Linton. As motorway service stations go, this is an unusually scenic one, being set within the broad valley of Upper Clydesdale and surrounded by hills that rise to almost 1400ft. The footer image shows Abington from the east. The west coast main line railway from London to Glasgow can be seen in the foreground, while the line of the M74 is marked by the white lorry in the gap in the trees just beyond the village. Its role as a gateway to Scotland is one Abington has fulfilled for two thousand years or more: today's A702 follows the line of a road the Romans built from the River Clyde here to their fort at Musselburgh. 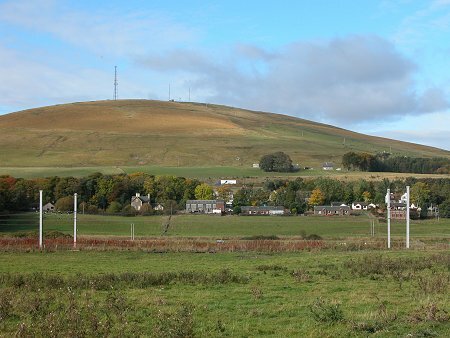 Other evidence of ancient occupation comes from the hill forts overlooking this stretch of the Clyde Valley, and from the motte and bailey near the services. The motorway services are a relatively new addition to the local scene. 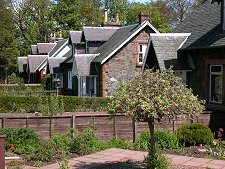 Less well known to today's travellers is the village of Abington itself, a short distance south on the A702. Until 1964 the village lay astride the main road from Carlisle, but in that year the village was bypassed by a new A74 dual carriageway to the west. This in turn was replaced by the M74 in the mid 1990s. 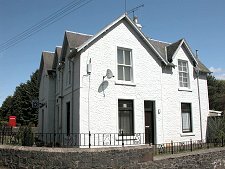 Abington is also bypassed by the main railway line to Glasgow, which runs along the east side of the River Clyde here. 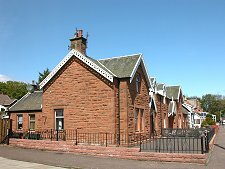 When the Caledonian Railway was built in 1847, Abington acquired an excellent station which helped the village grow. But while the west coast main line very much remains, the station closed in the mid 1960s. Abington itself is an attractive village focused on the Abington Hotel on one side of Carlisle Road and the village shop on the other. 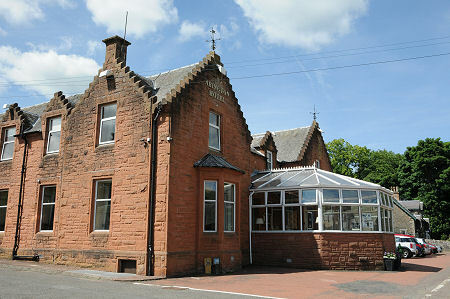 Other local services include fire and police stations and a bank. 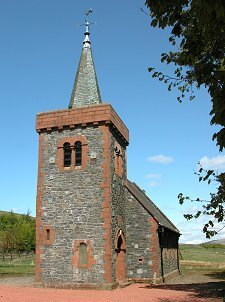 Hidden away up a woodland path from the centre of the village is Upper Clyde Parish Church, a beautiful little gem of grey and brown stone edged in red. 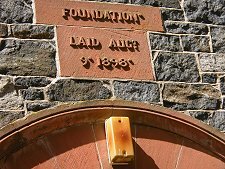 When its foundation stone was laid on 9 August 1898 its location must have been quietly idyllic. Today it lies close to the M74 motorway, though the traffic isn't nearly as intrusive as you might expect.